Hooray! Spring has arrived in Glasgow. And whether it’s here to stay or just passing through, getting outside is a must. And that’s exactly what we do. With food, drink and obligatory football we head off to Kelvingrove Park – just one of Glasgow’s beautiful open spaces, with the magnificent Art Gallery and Museum as our backdrop. Cherry blossom perfection – everything is in bloom. Ideal for picnicking or kicking about your ball of choice about – Kelvingrove Park is a microcosm of Glasgow so great for people-watching. Toddlers test out new walking feet, excited kids waver on bikes finally free from stabilisers and young lovers wander next to slow-stepping seniors. On a day like this, ice-cream is a must. And at Kelvingrove’s skate park we’re treated to the moves and manoeuvres of the boarders and BMX stunt bikers, young and old alike. Besides a lot of swerving around, there’s actually a few impressive stunts. We leisurely explore and end up at the Stewart Memorial Fountain, built in 1872 to commemorate Lord Provost Stewart of Murdostoun – apparently why we haven’t all died of cholera. We throw coins into the fountain, making secret wishes before reluctantly heading back to the car. Hanging out in Kelvingrove is the perfect way to spend a sunshine-filled afternoon. And even though we’ve seen a lot there’s still more to discover. Cypress Duck Pond and a Heritage Trail are definitely on the ‘to see’ list next time round. 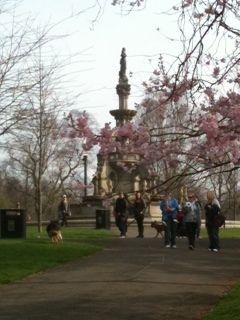 Sunshine is fleeting so get out in it and rejuvenate your soul in one of Glasgow’s beautiful green spaces.